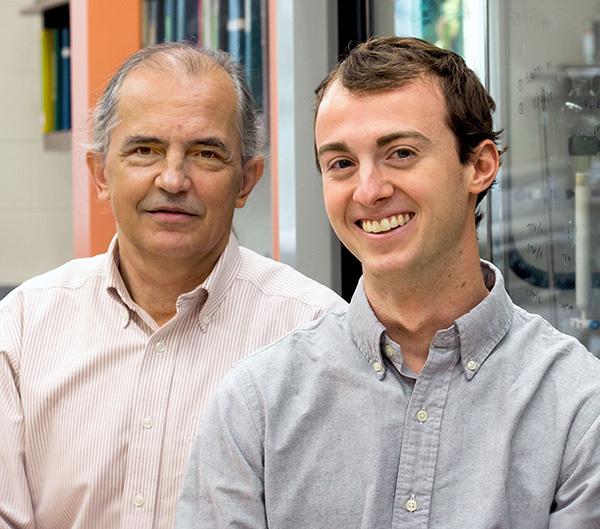 Two members of the ESF community-undergraduate Mike Jorgensen and Dr. Jose Giner, an associate professor of chemistry - recently published a paper in the prestigious Journal of the American Chemical Society (JACS) that reports a discovery with the potential to help advance the field of medicine, particularly the study of cancer. Jorgensen, a senior environmental health major and chemistry minor, and Giner made a discovery that could have positive implications for the study of cancer biology. The study was a collaborative project led by Dr. Brian Callahan, an assistant professor of biological chemistry at SUNY Binghamton. The focus of the research involves hedgehog proteins, a family of powerful signaling molecules that facilitate cell communication. Researchers first identified the hedgehog gene in fruit fly larvae, when they discovered a mutation resulting in the development of small, pointy projections resembling the spines of a hedgehog. Scientists later discovered three similar genes in vertebrates. These genes encode an important family of hedgehog proteins, the best-studied of which is sonic hedgehog, named after the SEGA videogame character Sonic the Hedgehog. Hedgehog proteins play key roles in the hedgehog signaling pathway. A signaling pathway involves a series of chemical messengers (e.g., hedgehog proteins) that work in sequence to relay information and elicit a cellular response. In humans, hedgehog signaling is essential for normal embryonic development, serving to communicate information for proper cell growth and differentiation. Although less active in adults, the pathway remains important for stem cell maintenance, and tissue repair and regeneration. When deregulated, it can lead to the development and spread of certain cancers. In turn, targeting and inhibiting components of the pathway can be an effective approach to treating and preventing some cancers. In Giner's laboratory, Jorgensen worked to discover and synthesize a potential hedgehog pathway inhibitor. Before a hedgehog protein can signal a cell to grow, it must first undergo a modification involving the introduction of cholesterol. If this reaction is inhibited, the pathway becomes inactive and the cell stops growing. "We were trying to stop a process," said Jorgensen. "So I made various compounds that could possibly accomplish that goal." At SUNY Binghamton, lab technician Daniel Ciulla analyzed the compounds synthesized at ESF. "We sent him samples periodically and he looked to see what he could find," said Jorgensen. "Is it a substrate (something that reacts in a process) or is it an inhibitor (something that stops a reaction)?" Ciulla tested some of the samples with normal proteins and others with non-functioning mutant proteins created by Callahan. One particular test, conducted with a mutant, yielded surprising results: the mutant, while unreactive with cholesterol, reacted to the test compound as if it were a substrate. "The reaction shouldn't have worked, but it did," said Giner. "We created something that will react with a protein that normally cannot react." "We were trying to make an inhibitor, but we ended up making a substrate," explained Jorgensen. "Now we have to figure out why." According to the researchers, an investigation into the mechanism of the unexpected reaction will be the focus of an upcoming paper. Additionally, Giner and future student researchers will continue the search for a hedgehog pathway inhibitor. Giner and Jorgensen believe the combination of Callahan's mutant and their substrate will allow researchers to study the role of hedgehog proteins in the development of cancer in a new way. "Chemical biology - that is, using chemicals to explore biology-is like a toolbox," said Giner, "and now we have a new tool." The substrate synthesized in the lab does not exist in nature. Therefore, explained Giner, "we can make cells with mutant proteins do different things and study them under non-natural conditions." The scientists reported their findings in a paper titled, "Chemical Bypass of General Base Catalysis in Hedgehog Protein Cholesterolysis Using a Hyper-Nucleophilic Substrate," in September.